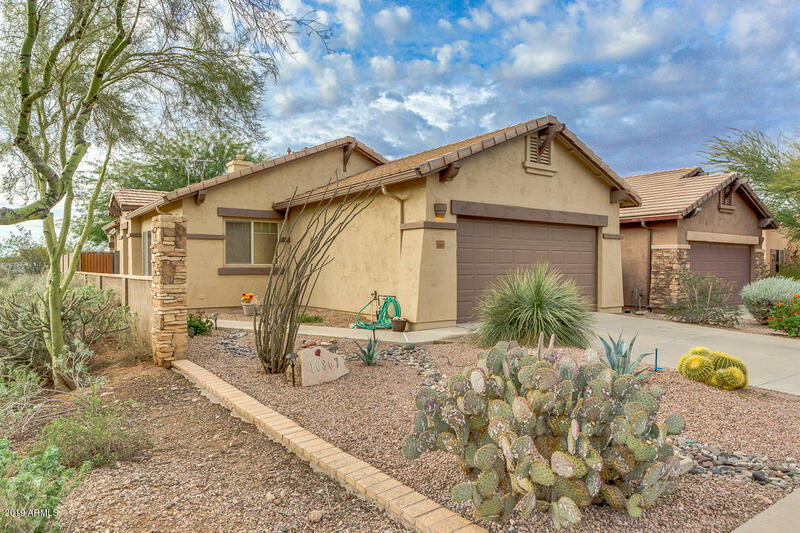 Immaculate 1,299 Sq Ft, 3 bed, 2 bath home with desert mountain views from multiple rooms in gorgeous gated community! Bright great room floor plan featuring, formal dining, tile flooring throughout, entertainment niche, designer paint, accessibility features which can be easily removed, and Murphy fold-down wall bed. Open kitchen with pantry, ample recessed oak cabinets, and recessed lighting. Elegant master suite with bayed windows, mountain views, walk -in shower, his /her sinks, and large walk-in closet. Enjoy the scenery from the low maintenance backyard including a cozy covered patio, wonderful shade tree plus artificial grassy area perfect for spending a sunny afternoon. Premier community featuring parks, miles of trails, playgrounds, basketball, ramadas, and more.